It’s difficult and nearly impossible to go through winter without catching a cold. Most people rely on Tylenol or cough medicine to get though a nasty cold, but these pharmaceuticals can do more harm than good – especially to your liver! Luckily, there are a lot of non-toxic DYI recipes to get you back on your feet. 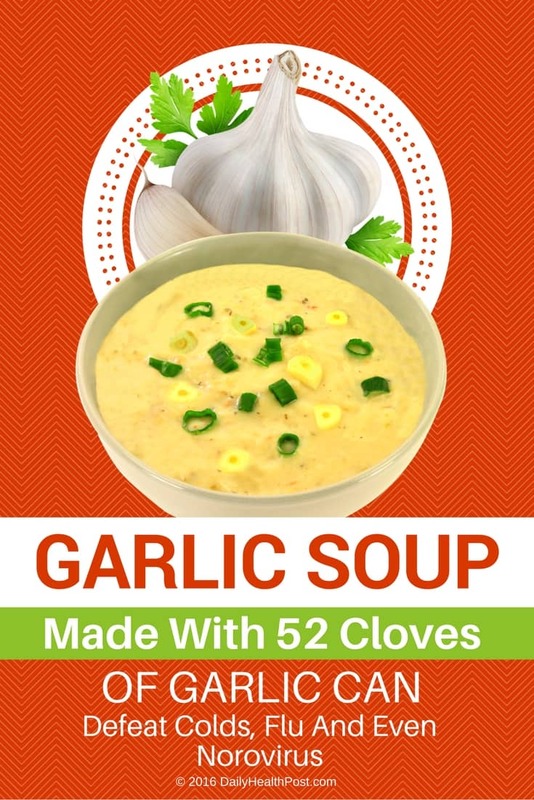 Some can be a little harder to stomach, so this yummy garlic soup is a great way to get your health back! How Can Garlic Heal A Cold ? Garlic has been used traditionally to heal the common cold. It’s actually the main ingredient of most natural cough syrup recipes. 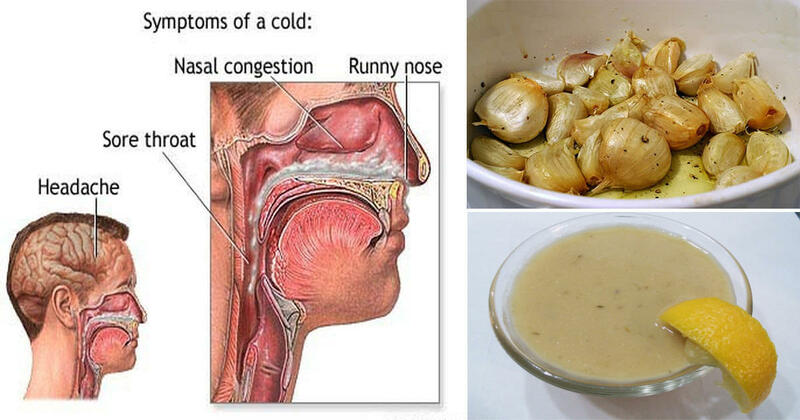 Many studies have shown that garlic can cure and prevent the common cold (1). Garlic contains Allicin, a powerful compound that’s activated when it’s crushed. This gives garlic its antifungal, antiparasitic, antimicrobacterial, antiparisitic and antiviral properties (2). This soup will warm you up from the inside out ! Place the 26 unpeeled cloves in a small glass baking dish and add the olive oil. If you don’t have a baking dish, you can also use tin foil to wrap the garlic and olive oil. Cover and bake for about 45 minutes or until the garlic is light brown. Allow to cool, then squeeze the garlic between your fingers to release the cloves in a small bowl. Melt butter in a large saucepan over medium-high heat. Add your onions, thyme, ginger, and cayenne powder. Cook until onions become translucent. Takes about 6 minutes. Add the roasted garlic and unroasted raw garlic cloves and cook for 3 minutes. Cover your pot with a lid and simmer for about 20 minutes. Put puree back in sauce pan; add coconut milk and bring to simmer. Season with sea salt and pepper for flavour. This recipe can be prepared 1 day ahead and can last a few days in the fridge, but it’s always better to eat it fresh. If you do eat it over the course of a few days, don’t microwave it! Instead, slowly reheat in a saucepan over medium heat.